I had The Logo Factory create a special logo for my company eSolia’s 10th anniversary, and they prepared a page with the deliverables on it. I did not want to download each one individually, and I remembered that the Safari Activities window allows you to access the objects on a page directly, such as various file attachments on a page. O’ Sensei of Safari, How Do We Achieve this Magic? Browse the page you want to download from, then open Activity from the Window menu. Find the page among the other pages if you have multiple tabs open. Use the disclosure triangle to open the outline of the objects on the page. Find and select your download targets. Press Cmd-C to copy to clipboard. 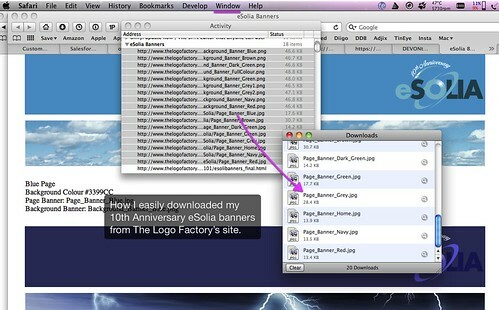 Display the Downloads dialog, also available in the Window menu, then paste into it. Cmd-v.
You should see the images or files start to download in the Downloads window. I hope this is helpful to someone.